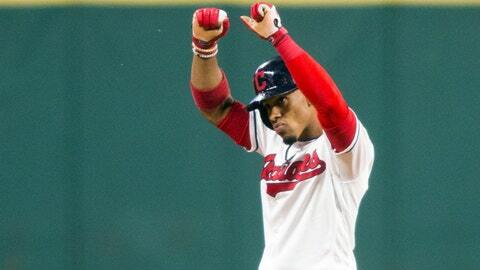 CLEVELAND (AP) — The Cleveland Indians stretched their franchise-record winning streak to 18 games, beating the Baltimore Orioles 3-2 Sunday night behind homers from Francisco Lindor and Roberto Perez. Cleveland’s streak is the longest in the majors since Oakland won 20 straight in 2002. Cleveland hasn’t lost since Aug. 23 and has outscored its opponents 121-32 in the streak. Cleveland has trailed in only four of 162 innings during the stretch. The best run in baseball history belongs to the New York Giants, who had a 26-game streak in 1916, according to the Elias Sports Bureau. The Giants’ streak included a tie, which doesn’t count as a game in baseball.